Last updated on Jan 17, 2017 Originally published on October 31, 2014 by malihu, under Plugins, Tutorials & snippets, WordPress. Basic tutorial for using “Page scroll to id” WordPress plugin on your WordPress site. Create id targets the page will scroll to or find existing id attributes in your theme to use with your links. Create links that point to those targets or enable the plugin on links that already exist in your site. In post visual editor, click the toolbar button “Insert Page scroll to id target” to create a target at the cursor position in the editor. In “Page scroll to id target” modal insert the id value you want (e.g. some-id) and click “OK”. The target shortcode (e.g. [ps2id id='some-id' target=''/]) will appear in the editor. Update/save the post/page. You can now use this id value in your link(s) URL (e.g. #some-id). Update/save the post/page so you can use this target value in your link(s) URL (e.g. #some-id). You can use plugin’s shortcodes in the block editor. Click on the “Add block” icon and select “Shortcode”. Add the [ps2id id='section-1'/] in the shortcode field to create a target with id section-1. You can also use the [ps2id_wrap] shortcode accordingly. If you use headings in your content, you can use the “HTML Anchor” attribute of the heading block to set its target id. Select your heading, click “Advanced” in the right panel and insert the target id you want in the “HTML Anchor” field. See detailed tutorial. You can generate id targets for any block element, by settings its class name to: ps2id-id-yourid. ps2id-id- plus the id you want. Create targets in your widget areas (Appearance → Widgets) via plugin’s “Page scroll to id target” widget. 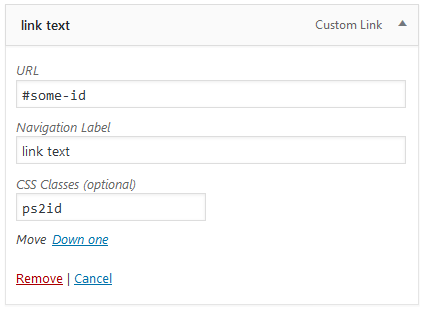 Keep in mind that all WordPress widgets have existing id values that you can use with your links. You can find these id values within each active widget under “Page scroll to id target” label. The option to display these values is “Display widgets id attribute” which is enabled by default. How do I find existing id attributes in my site/theme in order to use them as targets for my links? The plugin is enabled by default on WordPress Menu links (Appearance → Menus), so you can start adding custom links and set their URL to the id/target you want to scroll to. 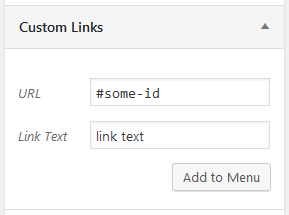 Edit your menu and add “Custom links” as these type of links allow us to enter a custom URL with the id we want. 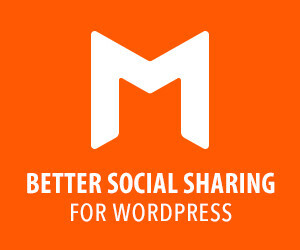 Your links URL should be in the form of #some-id, http://my-site.com/page/#some-id, /page/#some-id etc. Please note that if you want your links to work from other/different pages, you’ll need to insert the full address with the target id in their URL (e.g. http://my-site.com/page/#some-id) or the relative-root URL (e.g. /page/#some-id). In Appearance → Menus, click “Screen Options” at the top and make sure “CSS Classes” is checked. Edit each link you’ve created and insert the ps2id value in “CSS Classes” field. In addition to using the class field, the same can be done using the “Link Relationship” field (i.e. rel attribute). Click “Screen Options” at the top and make sure “Link Relationship (XFN)” is checked. Edit each link and insert the m_PageScroll2id value in “Link Relationship (XFN)” field. Any menu item/link with ps2id class or m_PageScroll2id rel attribute will be handled by the plugin. In post visual editor, click the toolbar button “Insert/edit Page scroll to id link” to create a link at the cursor position in the editor or from text you’ve already selected. In “Page scroll to id link” modal insert the link’s URL and text. The URL should be in the form of #some-id, http://my-site.com/page/#some-id, /page/#some-id etc. When ready, click “OK” and the link will appear in the editor. You can edit the link via both “Insert/edit link” and “Insert/edit Page scroll to id link” buttons, as well as inline. 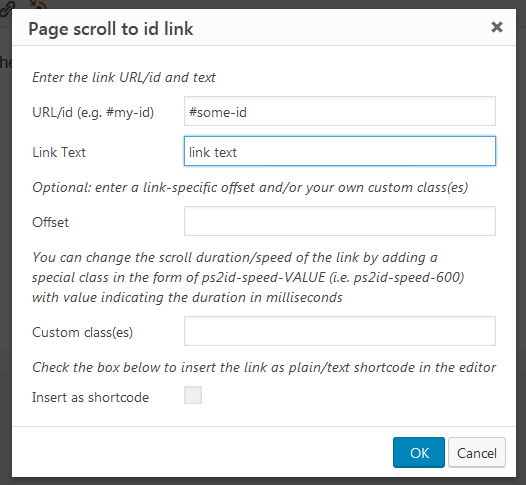 “Page scroll to id link” modal provides additional options like “Offset” and “Custom class(es)” that can be used to change link’s offset, its scroll duration/speed etc. In post visual or text editor, enter [ps2id url='#some-id']link text[/ps2id] in the place you want to create the link and set the url attribute and link’s text to the values you want. The shortcode provides the same options as plugin’s “Insert/edit Page scroll to id link” toolbar button via attributes. You can use plugin’s shortcodes in the block editor. Add the shortcode: [ps2id url='#some-id']link text[/ps2id] inside any block element to create a link that points to the “some-id” target. Keep in mind that since “Page scroll to id” version 1.6.3, the plugin is enabled by default on all links with a non-empty hash value (e.g. #some-id) in their URL. This means that you don’t have to use plugin’s shortcode to create links, as any link you create via the WordPress editor will work. You can instruct “Page scroll to id” to handle any link in your page(s) by using the “Selector(s)” field in plugin settings. How do I make my links work from any page in my site? Can I have links with different offsets? 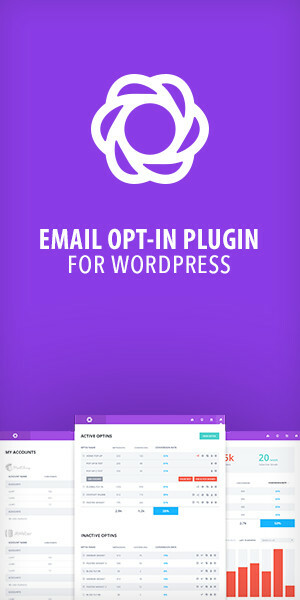 How to make the plugin work with WordPress Menu links? Can I have links with different scroll duration/speed? Each time a target element is visible on the screen (i.e. is within the viewport), the plugin adds the mPS2id-highlight class to its associated link or links (i.e. the links that scroll to this target). You can use this class in your theme’s stylesheet or custom CSS to style the current/active link(s), e.g. The default highlight classes for the links are: mPS2id-highlight, mPS2id-highlight-first and mPS2id-highlight-last (you can change these class-names in plugin’s settings if you want). For more information about the highlight classes and options see “Classes & highlight options”, “Highlight selector(s)” and FAQ below. How do I make my links stay highlighted for longer distance while scrolling? Multiple links get highlighted! How to highlight only one? If your page has a top sticky/fixed-positioned menu, you’ll probably need to use plugin’s “Offset” option in order to prevent the menu from overlapping your content. This option allows us to shift (i.e. offset) scrolling, so in the case of a top sticky menu, we usually need to “stop” scrolling a few pixels before the target reaches the top of the page (to accommodate for the space the sticky menu occupies). Go to Settings → Page scroll to id → Offset and insert an offset amount equal to your sticky menu height (in pixels). You can insert its height value as a number (e.g. 100) or you can insert your menu selector (e.g. #my-sticky-menu), so the plugin calculates its height automatically. The plugin provides special selector expressions in order to define advanced offsets and work with responsive menus. For more info see “Offset” option. The plugin has the option to scroll from/to different pages enabled by default. This means that when you click a link which points to a target id on another page, you’ll still get the smooth scrolling effect which will happen immediately after that page is fully loaded. The only thing you’ll need is to make sure your links have the full address with the target id in their URL (e.g. http://my-site.com/page/#some-id). Hi there, I’ve got the page scrolling from the menu bar links to down on the page just fine… the menu bar floats, and when I click “home” from further down the page, it doesn’t scroll up, it goes to the top of the page and makes a slight down scroll movement. Is it possible to scroll back up from a lower position to the top so it looks fluid? Could You help me with adding the blog page in the menu to scroll? This link will scroll to the news section (including the section large image). Is it possible to make it to scroll a little bit lower to the nwes not to the photo? If i will change in offset it will change in all pages but i only want to change it in News section. Could You tell me, do You know how to change the backgrounf color in menu in mobile version? You will need to add an id target on the “NEWS” title element but I’m not sure if your theme provides a way to do this without editing your template. Personally, I would just remove the news section heading image as it doesn’t add anything important to the user. i have deleted the photo You are right that this is not neccessary. Thank You for the background color help. What should i add to css to change the highlight when i am on for example contact? See more info about the highlight classes here. “Insert Page scroll to id target” button is not showing on mine. I already downloaded and activated the plugin. I’m at the “edit page” and it seems “Insert Page scroll to id target” button needs to be next to the “toolbar toggle” button, but I don’t see it. How can I make it be shown? Do you use a page builder plugin or tinymce advanced? I have the same problem and I use page builder i tinymce. What can I do? You can use plugin’s shortcodes. hmm I tried this option but still it doesn’t work. I’m not sure that I put shortcodes at good place. do you have any video tutiorial or tutorial step by step how can I do this? WordPress shortcodes are inserted inside the content editor (any content editor you use, e.g. 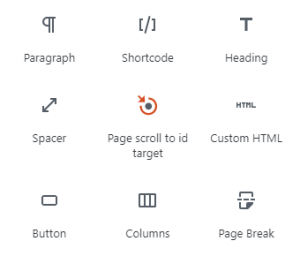 page builder text block, native wp visual editor etc.). An alternative is to enable the plugin to handle all in-page links in your theme and content. If you do this, the plugin will handle any link with a hash (.i.e. #) in its URL, so you can insert standard/normal links in your editor without the need to use “Page scroll to id” buttons or shortcodes. i have installed your Plugin on my page and i did everything right with the custom links in the menu as subitems. It works perfect on one site, the slide was perfect and smooth but then i wanted to do the same again on another site and i did everything exact the same way but now it don’t scroll to this id it just jumped. I don’t know what i did different or wrong. I really tried to do exactly the same. The plugin is not enabled on your menu links. This probably happens because the theme prevents “Page scroll to id” from being enabled on the menu items automatically. The easiest solution is to enable “Page scroll to id” on your links manually. I´m having trouble “anchoring” the elements to a menu in a theme since the existing anchors have no name, only ´#´. Can you give me a hint or pointers as how I´m able to use the plugin to create the menu from these anchors? You will not be able to use the plugin (or any similar plugin) with the way your theme works. Even without “Page scroll to id”, you cannot “jump” to any id target because the page has no scrollbar and all sections have the same height as the viewport (i.e. there’s nowhere to scroll to). Hi there. Thanks for making such a great plugin! Just wanted to ask about allowing the plugin to work on a pre-made button. I am trying to get the “FIND OUT MORE” button on my home page to scroll down but everytime I click it, it scrolls down and then refreshes the page. If I untick the “Prevent other scripts from handling plugin’s links (if possible)” option, the button will just jump to the id instead. The plugin works fine on the button. The problem is the link of the slide, which is added on the parent li element. When you click anywhere inside the “Giving Hope…” slide, the above script reloads the page. Have you added a link on this slide? Can you remove it? Just removed it and it totally fixed the problem! Thank you so much! Would have never realised it without you. into the selectors field it doesn’t seem to work for that same button. That is why i had to get the button working by adding the rel into it. Save changes and test the page. Hi Thanks for this plugin, I have small problem with this one : If my target is another page custom menu link. and now i’m in http://localhost/wordpress/page. i want to go home page #News section but link showing http://localhost/wordpress/page/#News. it’s not moving to #News section. Is this what you need? function special_nav_class ($classes, $item) have issue the active class applying for custom links. I’ve managed to get the scrolling hashtags and offset and speed to work correctly, but I think I’m messing up the menus — whenever I click a menu item, it re-loads the page and scrolls down to the section from the top, instead of scrolling up or down to the selected section from the section I’m on. The written instructions say to include the “page” in the Custom Link creation, but the video tutorial doesn’t seem to do that. When I don’t include the page name, the scrolling doesn’t work at all and clicking the links just jumps directly to the section. Your menu links URL do not seem to be correct. There’s no Home path in your server. Your page URL is americanaccesscontrols.com/wp/ but your links URL is americanaccesscontrols.com/wp/Home/. There’s no Home page in your site, so remove it from the URL. Also, your theme’s menu prevents “Page scroll to id” from being auto-enabled on its links, so you need to do it manually – see here. If you do the above, everything will work with or without the page name in your links URL. Hi, your plugin it’s amazing. Thanks. I have a little problem, because everytime that i click on a button, the page goes to top and after this goes to my section. I saw in your exemple, the other way, without this. How can i do to have like your exemple? I need to see your page in order to help. Can you post your URL? Firstly great plugin Malihu. Gladly donated to reward your skills! I’m using the plugin in a menu and also as image links within each section of the page. I get the same problem with both implementations, ie it doesn’t arrive at the start of each section (which starts with a header title). Have used various approaches to try and solve the issue; Link offsets in px values, offset with the menu id, adding stuff to the selector field…etc etc. As the sections on this scrolling page are classes rather than id’s it’s not possible to target the wrapper that defines each section. ( i believe). Is there any way i can get the plugin to function correctly in this scenario? Or is it a problem with the way my theme (menu) is implemented. I just checked your page. Your id targets are correctly set (no need to change them). Your off-menu links (e.g. the arrow image links) are handled by another script in your theme (...themes/hatch/highgrade/js/app.js). That’s why offset doesn’t work (the theme script overwrites “Page scroll to id”). That’s your theme’s header id. 2. Enable/check “Prevent other scripts from handling plugin’s links” option under “Advanced options”. Save changes and test your links. Everything should be working as expected. The arrow image links —while working better than before— still only arrive at the first text rather than the beginning of the section even after adding some offset values. (‘test link’ on page). Is this because of the underlying theme app.js file that you mention? If so i’m going to see if i can disable it someway. Thanks again. Keep up the good work. Yes, it’s because of the app.js theme file. Since “Prevent other scripts from handling plugin’s links” option cannot remove the app.js events automatically, you’ll have to do it manually. This will prevent app.js from handling “Page scroll to id” links (i.e. links with _ps2id class ). Save the file and test your links again. Took your advice and edited the .js file. It works better but currently it’s not quite getting the amount of scroll right. The page sections are slightly incorrectly offset even after allowing for the sticky menu. The scroll position seems to differ because the sections have different top padding. For example, “NOTRE VISION” section has 75px padding while “LE PRINCIPE” has 35px. You also have id targets within content (e.g. in “LE PRINCIPE”) and id targets on the sections themself (e.g. “NOTRE VISION”). You should add the target id on each section (like in “NOTRE VISION”) and each section top padding should normally be the same. Love the plugin! It works great on the mobile menu but I’m having an issue with the sticky nav. When I click on a link in the primary navigation, the page scrolls down but none of the links on the sticky nav get highlighted. I think the mobile menu is not allowing the sticky menu to work. This happens because you have the option “Allow only one highlighted element at a time” enabled. You’ll need to uncheck/disable this as it restricts highlighting only on one link (in your case the mobile menu one and not the desktop one). as your theme already have these target id attributes set. This means that you also don’t need the option “Keep the current element highlighted until the next one comes into view” checked. Works perfect! Thanks so much. In post visual editor, the toolbar button “Insert Page scroll to id target” do not appear. Do you use “Page Builder by SiteOrigin” (or something similar)? If yes, they do not allow custom buttons on their widget editor. I’ve tried every way (or I think I did) to enable the plugin on my menu links. It is still jumping instead of smooth scrolling. Also, I’m not sure if the selector for offset is correct. I used .menu-scroll-page-menu. Is it correct? 1. Your offset selector is correct. a) It adds the ps2id class on the “wrong” element. It doesn’t add the class on the link. It adds it on an inner i element. This is why the 2nd thing you tried didn’t work. b) The theme does not use the standard menu-item class. It only uses the current class and the menu-item-id class. That’s why the 1st thing you tried didn’t work. 1. Remove the ps2id class from the menu items (in Appearance -> Menu) as it’s not needed. Save changes and test your page. Everything should be working. Yes, that works amazing! Thank you so much Malihu. Visual composer allows you to enter an id on any composing block/element you choose (visual composer has an id field for almost all elements). to “Selector(s)” field in plugin settings. See here for more info. Hello, friend, your tutorial helps a lot two days onwards my mind is blowing. Thanks a lot. On the home page of http://www.airpurifiercritic.com/ I have this at the top [ps2id id=’some-id’ target=”/] and this at the bottom Back to Top it is not going to the top of the page what am I doing wrong? Hello, I have a button in a slider. I installed the plugin and created the anchor ID but the action jumps. I saw that you fixed the issue by adding the global selector a[href*=#] in “Selector(s)”, correct? Yes my friend, finally I found the solution in an old response of yours! Thanks for your time. I’m not sure how you translate posts(?) What multilingual plugin are you using and how you create the targets? Thanks a lot for this plugin. I wonder if is normal page reloads before scroll to section. I didn’t saw that in your video tutorial. Do you know what could be the problem? Can you help me? but it is the same. I put class ps2id in “CSS Classes” field at menu but no way. I tried the option “Prevent other scripts from handling plugin’s links (if possible)” but it seems the same. Make sure your links URL matches exactly the URL you see in browser’s address bar (e.g. missing the www part or having https). Yep, it works! Thanks for your quickly answer! Glad that i found your plugin – looks like it’s what i’m looking for a long time. But – like often, it won’t work like i really want – don’t know if i’m wrong with my work. Shortly said: we got five pages – and want to use the horizontal slide effect between the menu-points, that the page feels like “one big canvas”. Would be great if you could have look. Maybe deeper in the backend (if you want), i really like to donate for your plugin, if it works – because we appreciate a lot. The “Page layout” option does not transform your theme’s templates layout. In other words, it won’t change your theme/page design from (the standard) vertical to horizontal. This option simply informs plugin’s script that you want to scroll in a specific direction (vertical, horizontal or both). Your theme’s layout is currently vertical. You’ll need to either get a horizontal layout theme or create one manually (via CSS). You could use the markup and CSS of the horizontal demo as a basis if you want. Hope this clarifies what the option does. I don’t think you’ll be able to find a plugin that turns vertical themes to horizontal, as such layouts are completely depended on theme’s markup, CSS and the content itself. I’ve tried configuring your plugin but it doesn’t seem to be scrolling at all. I’ve tried using the link attribute ‘m_PageScroll2id’ but it just keeps jumping. I’m trying to get it to scroll to the bottom when you click on ‘contact us’ on the top nav. There is an ID of #enquire in that section. Are you able to tell me if there’s anything wrong? The plugin does not seem to be activated in your theme (plugin’s frontend scripts are not included in your HTML). Does your theme have wp_head() and wp_footer() functions? These functions are required for the plugin to work (in fact, most plugins won’t work without them). I’m trying to change the menu item text colour on scroll instead of highlighting the whole item using your plugin. Another CSS rule from your theme’s stylesheet is probably overwrites the a.mPS2id-highlight color rule you’ve set. You should try making your CSS selector more specific (e.g. .menu-item a.mPS2id-highlight is more specific than the one you’ve set). You can read about cascading order and inheritance in CSS here if you want. It’s impossible for me to know what selector to put as I don’t have your site URL in order to check it via browser’s developer tools. If you can post your site link, I’d be happy to help. This used to work perfectly for my site, but suddenly it has quit working and I cannot figure out why. Example: My page won’t scroll to the link below. It’s not “Page scroll to id”. Have you installed any new plugin(s)? The “J Shortcodes” plugin produces js errors that prevent other code from working. I don’t think you should use this plugin. It was last updated 4 years ago! My blog is a list of events for the month. I would like to scroll to the current date inside the document automatically on load. This cannot be done automatically. The plugin has the ability to scroll programmatically but you’d need to develop a custom js script and call plugin’s scrollTo method on the id of the current date event. You’d need a web developer to do this. Hello Sir! I love your plugin! Thanks so much for it! Quick question though. If I add menu item that points to, for example #portfolio it does not scroll, it jumps, when I put in the whole site name+#portfolio it reloads the page and then scrolls smoothly. Is there any way to make it work so it scroll without reloading the website? Thanks so much! Any help would be appreciated! Do you mean you can’t see the plugin’s insert link/target buttons in WordPress post/page editor? If yes, you’re probably using a site builder like “Siteorigin page builder”(?) Some builders do not allow custom buttons in the editor’s toolbar. I have implemented your great plugin on my site, and it seems to be working selectively. I have coded the links the same way on my site, yet only half function. When selecting a location (Atlantic, Western, Ontario, Quebec) – the anchor just jumps to it’s location. However, when you press Back to Top, it scrolls perfectly. Any idea on the issue at hand? Thanks in advance. Your target elements (for “ATLANTIC”, “QUEBEC” etc.) do not have id attributes. The elements use the (deprecated) name attribute which will not work with “Page scroll to id”. You need to change the name to id attribute or create the targets via plugin’s button/shortcode. Wow – thanks for catching that. I’m not even sure how the name tag was used. Works great now. Thanks for the prompt reply, and solution. I’ve been starting at a screen for too long!